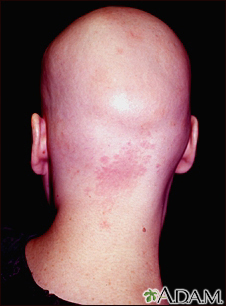 Alopecia areata is thought to be an autoimmune condition. This occurs when the immune system mistakenly attacks and destroys healthy hair follicles. Some people with this condition have a family history of alopecia. Alopecia areata is seen in men, women, and children. In a few people, hair loss may occur after a major life event such as an illness, pregnancy, or trauma. Partial or complete loss of hair is called alopecia. 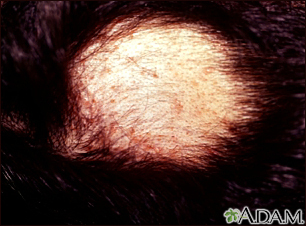 Alopecia areata usually begins as one to several (1 cm to 4 cm) patches of hair loss. Hair loss is most often seen on the scalp. It may also occur in the beard, eyebrows, pubic hair, and arms or legs in some people. Nail pitting may also occur. If alopecia areata leads to total hair loss, it often occurs within 6 months after symptoms first start. The health care provider will examine you and ask about your symptoms, focusing on areas where you have hair loss. A scalp biopsy may be done. Blood tests may also be done to check for autoimmune conditions and thyroid problems. A wig may be used to hide areas of hair loss. Call your provider if you are concerned about hair loss. Gawkrodger DJ, Ardern-Jones MR. Disorders of hair. In: Gawkrodger DJ, Ardern-Jones MR, eds. Dermatology: An Illustrated Colour Text. 6th ed. Philadelphia, PA: Elsevier; 2017:chap 35. 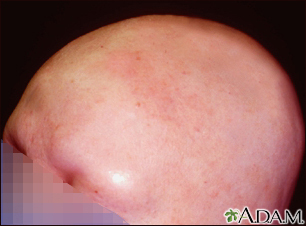 Pus-filled lesions (pustules) are unusual in alopecia areata, but can occur, as in this picture. The pustules are infected where medication was injected into the area. Hair loss is referred to as alopecia. Patchy hair loss on the scalp is called alopecia areata. Complete scalp hair loss is alopecia totalis. Loss of all body hair is called alopecia universalis. Hair loss is referred to as alopecia. Patchy hair loss on the scalp is called alopecia areata. Complete scalp hair loss is alopecia totalis. Hair loss from the entire body, including the eyebrows, eyelashes, and body hair, is alopecia universalis. This picture shows alopecia areata, under treatment. The hair loss is being treated with anthralin, which causes the brownish hyperpigmentation and can induce hair regrowth. It is very unlikely regrowth will occur when hair is lost along the scalp margin (ophiasis).